Hyundai is making a strong entry into the Mexican market to face their competitors. With an investment amounting to US$83.3 million to open the first 20 dealerships, which will start selling three models, the purpose is selling 8,000 vehicles to Mexican consumers this year. In the meanwhile, they remain in close contact with the Ministry of the Economy, to have Hyundai cars assembled in Mexico in the near future. Last weekend, a spokesperson informed that Hyundai has plans to open 20 dealerships, 14 to be inaugurated next May, while the remaining 6 will be opened throughout the rest of the year. 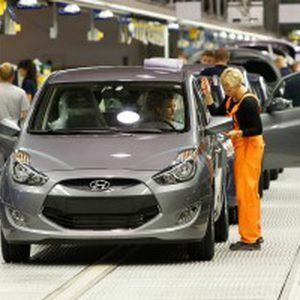 “This is the best time to enter into the automobiles market in Mexico, since the country is showing great growth and potential”, Pedro Albarran, CEO, Hyundai Motor de Mexico, said. The US$83.3 million investment made by this Korean company in dealerships and distribution centers will generate 1,500 new jobs, with a commitment to increase the figure with the new plant. From the 20 dealerships, 20 will be located in Mexico City and the metropolitan area, one in Toluca, two in Guadalajara, two in Monterrey, one in Puebla, one in Merida and one in Tijuana. For the time being, Hyundai will bring the vehicles from their plant in Alabama, United States and Korea. But Albarran warned that there will soon be more surprises for the Mexican market. “Right now we are focused on the commercial area; and the company is interested on making investments in Mexico”.